ROME (Crux) – Senators in Pope Francis’ native Argentina voted against a bill that would have legalized abortion on demand until week 14 of a pregnancy early Thursday morning, following a marathon session that came as the latest twist in a three-month national debate marked with massive public rallies both in favor and against the measure. Pro-abortion rights groups had issued threats of “burning down churches” ahead of the vote, leading the national government to protect church buildings. Among other measures, security forces barricaded the cathedral in the national capital where Pope Francis used to say Mass when he was Archbishop of Buenos Aires, along with many other historic churches in the area close to the halls of Congress. Argentine President Mauricio Macri announced in March that despite being personally against abortion, he would allow Congress to debate a bill to legalize it. It’s the first time in over a decade that abortion was discussed at a parliamentary level in Pope Francis’ home country. As the senators were still debating the bill, Cardinal Mario Poli, who succeeded Pope Francis in the archdiocese of Buenos Aires, celebrated a Mass at the cathedral, which is about half a mile from congress. During the debate, Pope Francis remained quiet, delivering several remarks against abortion, but never directly referring to what was happening in Argentina. 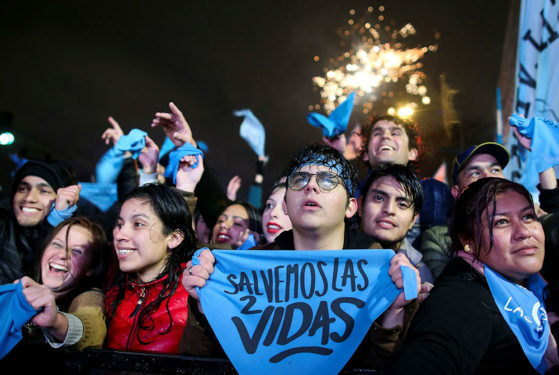 However, on Wednesday morning Rome time, during his weekly Wednesday audience, a group of Argentine pilgrims had a light-blue flag on display, with the motto of the pro-life campaign, “Let’s save both lives,” and the pope was seen giving a blessing to the group.